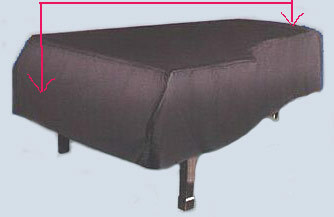 With over 30 years experience, our expert sewers make the finest piano covers in the industry. Our covers can be seen on the pianos at Hollywood's Academy of Motion Picture Arts & Sciences, the Smithsonian Institute & even the TV show Desperate Housewives bought their Piano Covers from us. The cover sizes listed below can be used on many different makes of pianos. To determine the size (length) of your grand piano, measure in a straight line from the farthest end at the back curve, across the top of the closed lid, to in FRONT of the keys. - (as shown in the picture above) or.... underneath the piano from front to back. Click on fabric for a full description. Custom Made Covers - No extra charge. 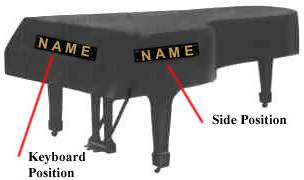 Important: Please type in the Name & Size of your Piano in the box provided. in the drop down box above and the price will be the same as the next size listed. I chose to go with the custom fit vinyl cover since it was no extra cost. I'm really glad I did because the cover fits beautifully. All I had to do was make a template, send it in and I got my cover in about a week. Service was super fast and excellent quality. The company was very helpful as this was the first cover I've ever ordered. They helped me decide the proper size. It was delivered right on time and the fit was great. It arrived in a timely manner in great shape and fits perfectly. Thank you so much.